If I go quiet – it’s because I’m busy, taking it easy, or on holiday. This time it was the latter. Oh well, back to normal, whatever that is? Anyway, saw 30120 working at Bodmin last week, so some photos to sort. This entry was posted in My uninteresting stuff on May 31, 2011 by Sharpo. A few hours at Bewdley with all the above locos seen in action. Auto Trailer 238 was also photographed from the end of the platform & looking immaculate. This entry was posted in Sharpo's World Photo Updates on May 19, 2011 by Sharpo. After not seeing this train for several weeks due to it running up the Lickey, or beating me to the station as it did last week – it had a more leisurely run from Worcester today & I was there in plenty of time. It’s not easy getting “different” photos here, as a “down” train is due at around the same time this working passes through & I’m always close to the footbridge in case I have to take a photo from above to avoid the DMU passing through. 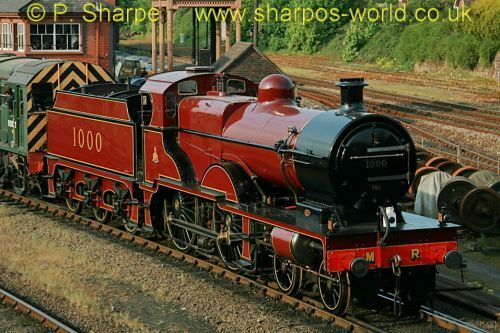 This entry was posted in Sharpo's World Photo Updates on May 18, 2011 by Sharpo. This was the second day for the convoy, D1062 having been dropped off at Kidderminster the previous day, and are seen heading for Barrow Hill. The light here wasn’t very good, white sky & locos in dull conditions – but the photos aren’t too bad! 45407 & 44871 are seen at Kidderminster after travelling from Southall. 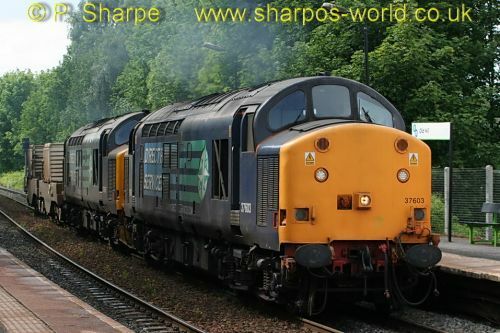 The photos show them approaching, then running into the set back siding before reversing to the down line for access to Severn Valley Railway tracks. 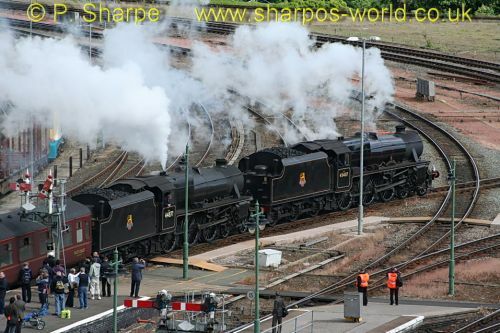 The locos are seen at Kidderminster as they cross onto the Severn Valley Railway. Also running today were D8059, 50031, 7812, 5164 & 46443 on Footplate Experience. There should only have been 1 diesel running, but with the shortage of available steam locos a 2nd diesel had to be used. One of the Black 5s should be working the Limited on Sunday. 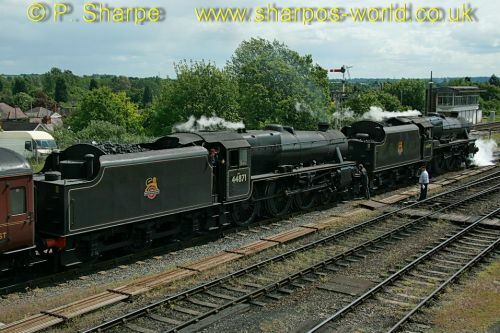 In this shot, 45407 is being uncoupled & will couple to the rear of the support coaches before running to Bridgnorth. This helps to spread the load as they cross Victoria Bridge. This entry was posted in Sharpo's World Photo Updates on May 15, 2011 by Sharpo. Rushing across from Small Heath after seeing the A4 we were in plenty of time to see the Black 5s arrive from Carnforth with the railtour to Carmarthen. The train was about 20 minutes late arriving and was away in less than 5 minutes, so there were only seconds to spare after a mad dash up to the castle wall to see the train departing. Thanks to the person from the museum, who allowed us a couple of minutes to see the train depart – as it was locking-up time! 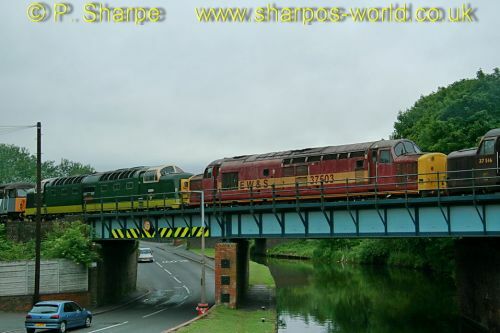 This entry was posted in Sharpo's World Photo Updates on May 13, 2011 by Sharpo. 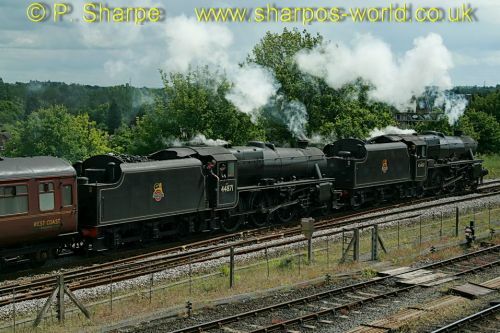 The William Shakespeare, hauled by 4492, ran from York to Stratford-upon-Avon & return. As far as I know, this is the only appearance of the loco in the West Midlands this year, but at least I managed plenty of photos of it. 60019/4492 now looks very smart in garter blue livery, with full streamling, and was running with the second tender. Sun & smoke, can’t be bad!! 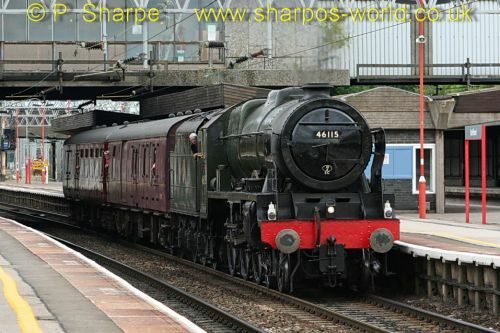 46115 was heading to Carnforth from Southall, and we stopped off at Stafford after the DRS Open Day to see it. There are always photos that don’t get uploaded, and these were some of them. Saying that, I still haven’t sorted the DRS photos. This entry was posted in Sharpo's World Photo Updates on May 11, 2011 by Sharpo. The Glasgow to Southampton boat train was my reason for a trip to Leamington. Also managed some shots of coach 9537. 5 other freight locos were seen, including 66580, one of the former Freightliner locos but now in use with GBRf. The other loco worth mentioning, and one I hadn’t seen before, was 70009. 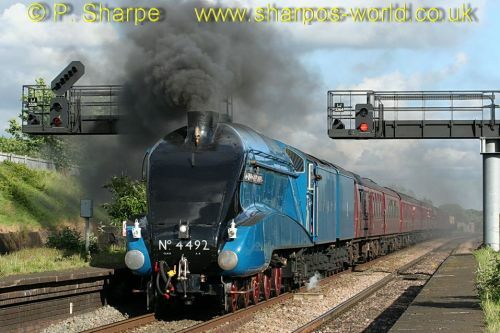 This entry was posted in Sharpo's World Photo Updates on May 9, 2011 by Sharpo. Soon after seeing the Swanage convoy at Kidderminster, the signals were pulled off for a train from the Bewdley direction. I had heard that the Compound was due to be moved from the Engine House & hoped this was it! Sure enough, it was, hauled by D3022. Arriving at Kidderminster, it was soon shunted into the carriage shed. 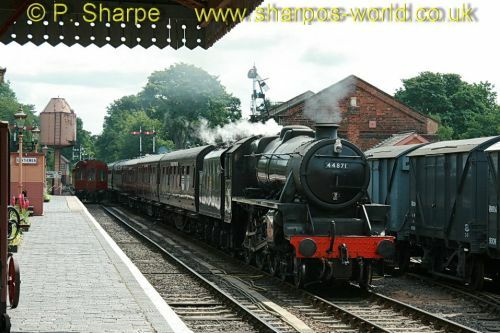 This entry was posted in Sharpo's World Photo Updates on May 8, 2011 by Sharpo. 57601 hauls 56301, 37503 & D9009 onto SVR tracks at Kidderminster. D1062 is attached to the rear & the locos are moved back onto the exchange siding, ready for the journey to Swanage the following day. 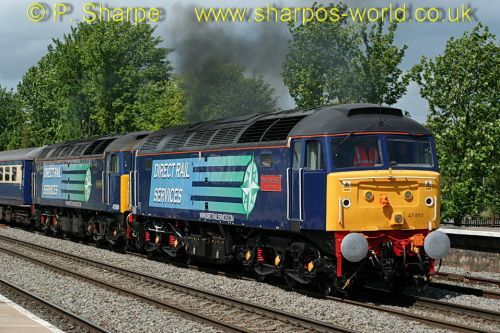 Also of interest are DRS locos 20303 & 37059 seen passing on 6M67 Bridgwater to Crewe flask train.